Three years ago today, Gabriel García Márquez died. For a long time, I thought that his imaginary Macondo had been inspired by Cartagena, a town in the Colombian Caribbean. Even when I was told that it hadn’t been Cartagena, I kept believing whatever I wanted to believe. I didn’t want my dream destination to be based on a false statement. Since 2003, my first year at journalism school, he has been my favorite writer. If one day I made it to Colombia, it was going to be to see Gabo’s Cartagena. I was introduced to the fantastic world of Gabriel García Márquez with “Love in the Times of Cholera”. Then many others came. He’s the author I’ve read the most. However, “One Hundred Years of Solitude” stands waiting for me on the shelf. I bought a pretty, special hard cover edition, and even flipped through it. But I did not get through the first page. The chemistry of the book wishing to be read didn’t reach me the moment I opened it. I feel our time is approaching, though. Between Panama and Colombia, the Pan-American highway, which connects Alaska to Ushuaia, is interrupted. The jungle of the Darien region takes over and there is no way to go by car. Many adventurers have tried to cross the region on foot; it seems no one has survived to tell their story. So we took a direct flight in Panama City with Wingo, the economic arm of Copa Airlines, and less than 50 minutes later we were landing in our first South America city on this trip, even if it were to the north of the Ecuador. 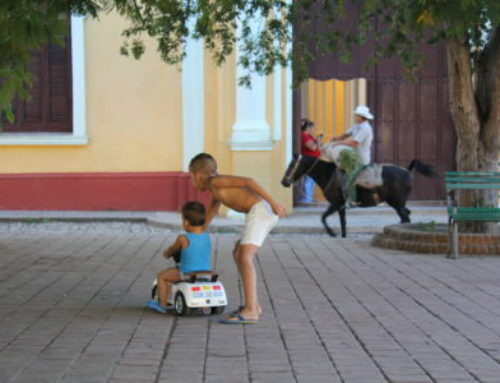 It was hot, very hot in Cartagena. Hoje faz três anos que Gabriel García Márquez faleceu. Por muito tempo, achei que sua Macondo imaginária tinha sido inspirada em Cartagena, cidadezinha banhada pelo Caribe colombiano. Mesmo quando recentemente me falaram que não, que não havia sido Cartagena a inspiração, ignorei e segui acreditando no que queria acreditar. Não queria que meu destino dos sonhos tivesse sido criado baseado num equívoco. Desde 2003, o primeiro ano da faculdade de jornalismo, ele é meu escritor favorito. Se um dia fosse pra Colômbia, era pra conhecer a Cartagena do Gabo. Fui introduzida ao fantástico mundo de Gabriel García Márquez com “O Amor nos Tempos do Cólera”. Depois, vieram muitos outros. É o autor que mais li. Até hoje, no entanto, “Cem Anos de Solidão” permanece ali me esperando na prateleira. Comprei uma edição especial de aniversário bonitona, capa dura, e até cheguei a folheá-la. Mas não passei da primeira página. Não rolou aquela química do livro querer ser lido no momento em que eu o abri. Mas sinto que nossa hora se aproxima. 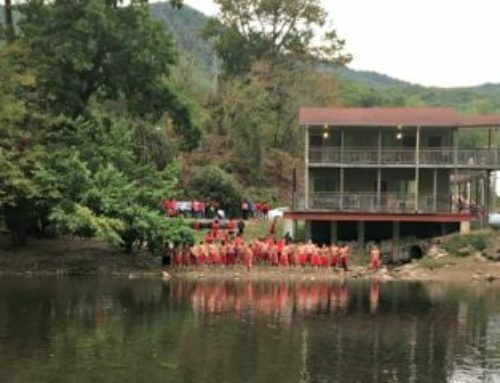 Entre o Panamá e a Colômbia, a estrada Pan-Americana, que liga o Alaska ao Ushuaia, é interrompida. A selva da região Darién toma conta e não há como percorrê-la em carro. Muitos aventureiros já tentaram cruzar a região a pé; parece que não houve quem tenha sobrevivido para contar história. Então, da Cidade do Panamá, pegamos um voo direto da recém-lançada Wingo, o braço econômico da Copa, e menos de 50 minutos depois chegávamos à nossa primeira cidade na América do Sul, mesmo que ainda ao norte da linha do Equador. Fazia calor, muito calor em Cartagena. The taxi dropped us off at a very simple hotel a few steps from the port, where we would spend the next two days getting paperwork done to release our car, which sailed from Colon, in Panama, to Colombia in a container with four motorcycles. A process that requires a lot of patience and time. 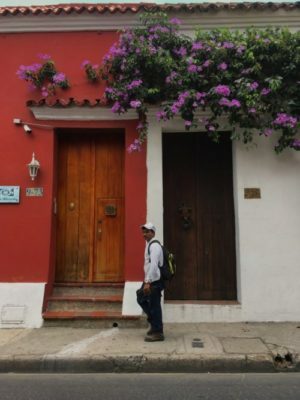 For the first 48 hours in Cartagena, I controlled my emotions. I wanted to save up for when I was free to exclusively see the city of my dear author. O taxi nos deixou numa pousada bem simples a alguns passos do porto, região em que passaríamos os próximos dois dias resolvendo burocracias para liberar o carro, vindo de contêiner com quatro motos pelo Caribe desde Colón, no Panamá. Um processo chato que exige muita paciência e tempo. Durante as primeiras 48 horas em Cartagena, segurei a emoção. 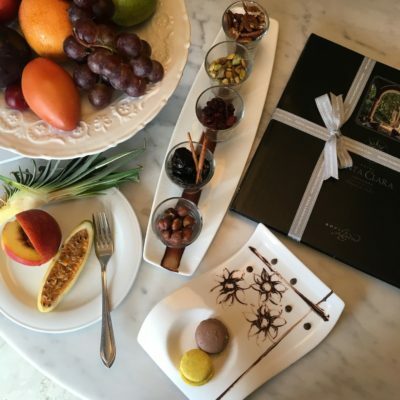 Queria economizar pra quando estivesse livre para exclusivamente conhecer a cidade do meu autor querido. And the moment came. On Wednesday, around 3 pm, sweaty and exhausted, we finally left the port driving towards Sofitel Santa Clara. Pause: we spent a complimentary night at the hotel for me to write a review. Our budget could never afford it. Santa Clara Hotel was a former convent of the Order of Poor Clares, who lived in seclusion and could not be seen (something I think I will never understand). 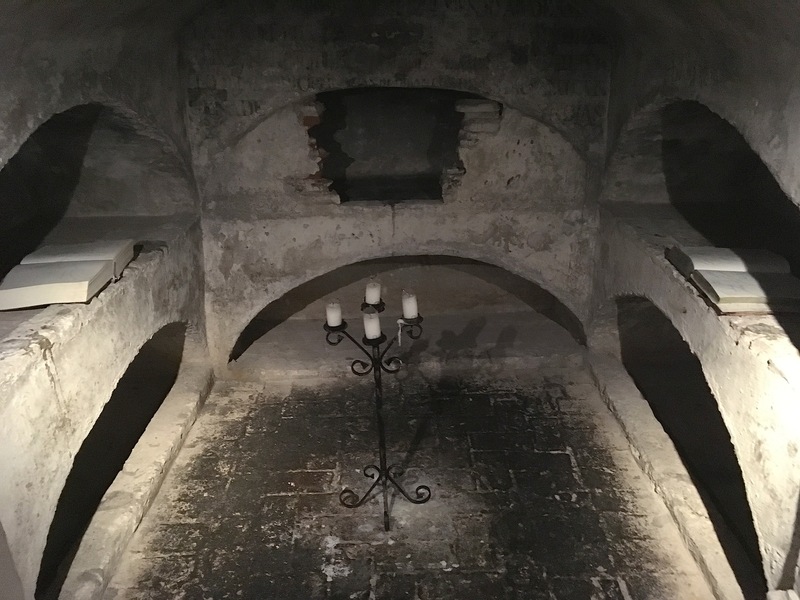 One day, many years after the convent was deactivated, the young reporter Gabriel García Márquez witnessed the excavation of an old crypt. It is told that he was there when a young lady’s skeleton with twenty-two meters and 11 centimeters of hair was found. Years later, it would inspire him to write “Of Love and Other Demons”. 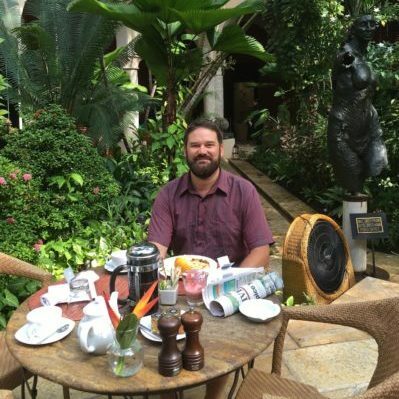 After reading the book, this hotel soon turned into a dream of consumption for me. I knew one day I was going to spend a night there. Nothing better after two days under the sun, running around like a chicken with its head cut off from the port to customs, to the insurance office, to the copy machine place, to the bank, to the importer/exporter and vice-versa, than checking in to a five-star hotel with cold, little towels and refreshing tea as soon as you step in. Getting there was surreal. I felt like I was entering into a parallel world. I was ready to celebrate with pleasure our arrival to Cartagena, at last. Too bad it was going to be a single night reality. E o momento chegou. Na quarta-feira, por volta das 15h, finalmente saímos suados e exaustos do porto dirigindo em direção ao Sofitel Santa Clara. Pausa: passamos uma noite cortesia no hotel cinco estrelas para escrever uma matéria. Nosso orçamento não bancaria essa mordomia. O Hotel Santa Clara foi um antigo convento das irmãs clarissas que viviam reclusas, não podiam ser vistas (algo que nunca vou entender). Um dia, muitos anos depois do convento ter sido desativado, o jovem repórter Gabriel García Márquez acompanhava a escavação de uma das antigas criptas. Diz a lenda que ele estava lá quando descobriram o esqueleto da menina com 22 m e 11 cm de cabelo, que mais tarde inspiraria “Do Amor e Outros Demônios”. Depois de ter lido o livro, esse hotel logo se transformou num sonho de consumo. Sabia que um dia iria me hospedar ali. Nada melhor depois de dois dias penando sob o sol, caminhando feito barata tonta do porto pra alfândega, pro escritório de seguro, pro lugar de fazer cópias, pro banco, pra importadora e vice-versa, do que chegar a um hotel cinco estrelas que te oferece toalhinhas frias e chá refrescante no check-in. Chegar ali foi surreal. Senti como se estivesse entrando numa realidade paralela. Finalmente comemorei com gosto a chegada a Cartagena. Pena que estaríamos ali somente por uma noite. No único dia inteiro que passamos tranquilos pela cidade, caminhamos horas na parte rodeada pelo muro da época dos espanhóis, que protegia a cidade dos piratas ingleses. No hotel, a antiga cripta onde o esqueleto da menina foi encontrado, no subsolo do que hoje é o bar, está aberta para visitas sempre que o bar está aberto. Radiante, saboreei cada passo que dava ao descer os degraus de pedra, bem espaçados. E me arrepiei ao ler a plaquinha: “Onde tudo começou”. By now my stubbornness had given way to happiness. 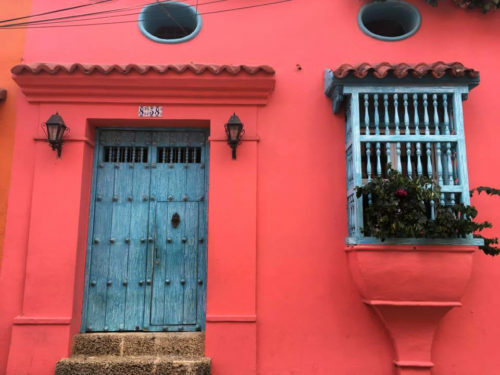 It’s okay that Cartagena is not Macondo! 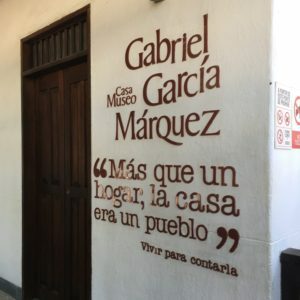 My expectations were being more than met when I found out that Gabo had a house in Cartagena and used to spend long vacations there. The house is close to the hotel and might become a museum in the future. I was also happy to find out that his ashes were deposited at the University of Cartagena, his alma mater. We walked over there, but because it’s now closed to visitors, we could only see his bronze bust from the entrance. 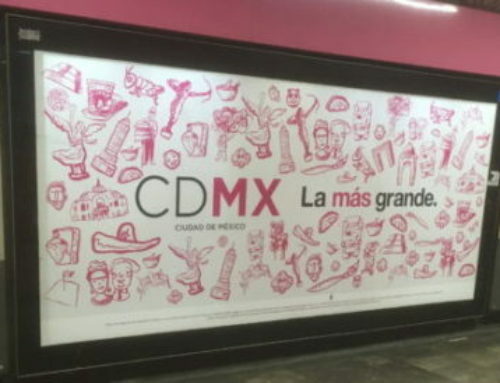 Also, even though Macondo was not born here, “From Love and Other Demons” was, and there I was, practically where the embryo of the book began, hahaha. For me, entering that crypt was one of the highlights of this journey through the Americas so far. Our time in Cartagena can be summed up by spending time in the port, being dazzled by a crypt and quotes from Gabo’s works throughout the old-convent-now-hotel, tasting exotic, delicious fruits I had never imagined existed, making great new friends for life and walking through the stone streets filled with adorable colorful houses. A essa altura, minha teimosia já tinha dado lugar para felicidade. Tudo bem que Cartagena não é Macondo! 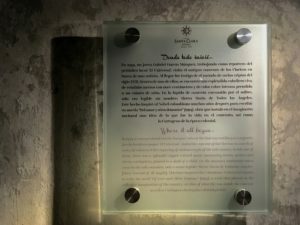 Minhas expectativas estavam sendo mais que atendidas quando descobri que ele passou longas temporadas numa casa vizinha ao hotel – que deve virar museu no futuro -, e que suas cinzas foram depositadas na Universidade de Cartagena, onde ele estudou. Fomos até lá, mas só pudemos observar o busto de bronze sob o qual supostamente estão as cinzas a partir da rua: no momento, a universidade está fechada para visitas. Além disso, mesmo que Macondo não tenha nascido aqui, “Do Amor e Outros Demônios” nasceu, e lá estava eu, praticamente onde o embrião do livro começou, hahaha. Pra mim, entrar naquela cripta foi, até agora, um dos pontos altos da viagem. 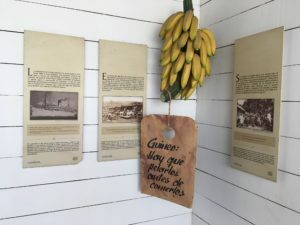 Se quiser, dá pra resumir Cartagena em: resolver papelada no porto, deslumbrar-se com uma tumba e citações de obras de Gabo espalhadas pelo antigo-convento-hoje-hotel, comer frutas deliciosas nunca antes imaginadas, fazer novos amigos pra vida e caminhar pelas ruas de pedra repletas de adoráveis casinhas coloridas. 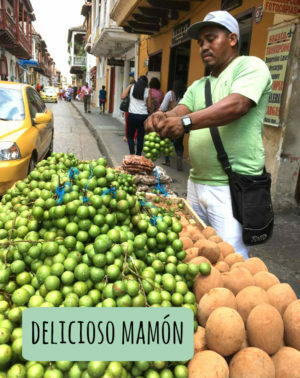 Macondo, in fact, was inspired by Aracataca, a little south of Cartagena, which we obviously included in the itinerary. We arrived there on Sunday, two hours before the house-museum closed. After a three-minute guided tour, we were able to photograph as much as we wanted, but no videos are allowed. The house is well aired to soften the heat a bit, it has a big corridor that connects the two main parts and, in the back, a big tree that used to host long talks under it’s leaves. It is, actually, Gabo’s maternal grandparents’ house, where he lived until he was 9 years old, when his grandfather died. 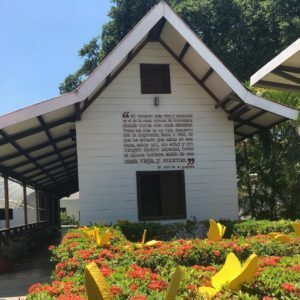 Many quotes and explanations in Spanish and English along the rooms show how connected the little boy and his grandfather were. They even had a door connecting their bedrooms. One learns how important being raised by that family and in that house were for Gabo’s books. I enjoyed picturing little Gabito running around, playing with his cousin Sara Emilia, who was also raised by the grandparents, and drawing on the wall while his grandpa was busy making little metal fishes. 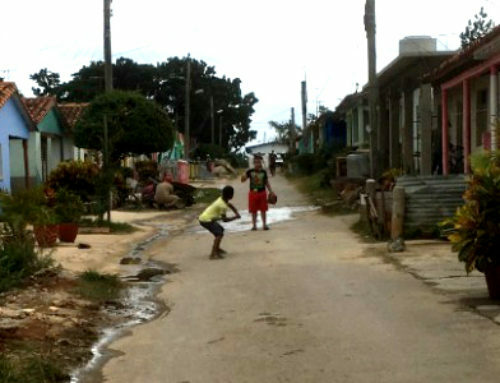 Macondo, na verdade, foi inspirada em Aracataca, um pouco ao sul de Cartagena, que obviamente incluímos no roteiro. Chegamos ali no domingo, duas horas antes da casa-museu fechar. Depois de um tour guiado de três minutos, pudemos fotografar à vontade, mas nada de vídeos. A casa é arejada – pra amenizar um pouco o calor -, tem um corredorzão que liga as duas partes principais e, no fundo, uma árvore frondosa cuja copa abrigava rodas de conversa. Na verdade, é a casa dos avôs maternos de Gabo e onde ele viveu até os 9 anos, idade que tinha quando o avô faleceu. Pelos aposentos e corredores, as diversas citações e explicações em espanhol e inglês mostram como o menino e o avô eram apegados – a ponto de uma porta conectar o quarto dos dois -, e quanto ter vivido naquela casa, cercado daquelas pessoas, foi importante na gestação de suas obras. Adorei imaginar o pequeno Gabito correndo por ali, brincando com a prima Sara Emilia, também criada pelos avós, e desenhando na parede enquanto o avô fazia peixinhos de metal. Of all the quotes, the one that touched me the most was this: “The person with whom I got along with best and with whom I had the best communication in my life. Whenever something good happens to me, I feel that the only thing I am missing to achieve ultimate happiness is sharing it with my grandfather”. 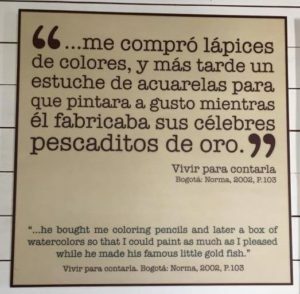 I am now looking for the book where this quote was published, “El olor de la guayaba” (The smell of the guava), an interview he gave that was published in 1982. 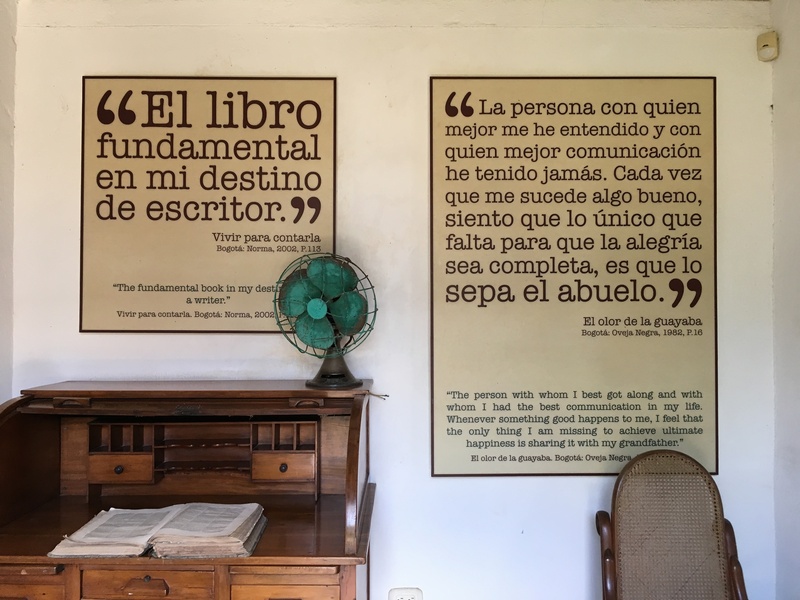 In Aracataca, as unbelievable as it can sound, there are no book shops. It’s ironic that the town that had such a huge importance to the only Literature Nobel in Colombia doesn’t sell his books. In Bogota, at the Cultural Center Gabriel García Márquez, we found another one that I felt like reading after visiting his house: “Vivir para contarla” (Living to tell it), the first part of an auto-biography published in 2002. This one I started, and I have already enjoyed it from the first page. All’s well that ends well. We arrived happily in Cartagena to begin our trip in South America, and left Aracataca contented. Now, everything that we enjoy in the rest of Colombia will be extra great. De todas as citações, a que mais me emocionou foi essa (que aqui ouso traduzir): “A pessoa com quem melhor me entendi e com quem estabeleci a melhor comunicação. Cada vez que me sucede algo de bom, sinto que o único que falta para a alegria ser completa é que o avô saiba”. Estou em busca agora do livro em que isso aparece, “El olor de la guayaba”, uma entrevista dele em publicada em 1982. Em Aracataca, pasmem, não há uma única livraria sequer. 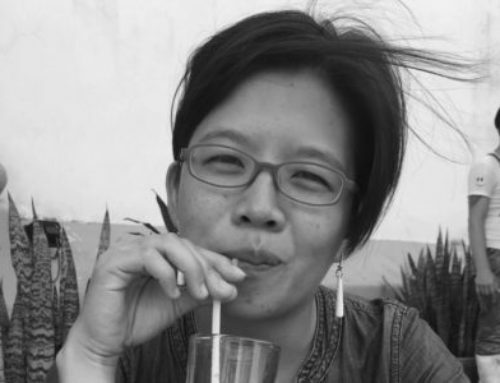 Irônico que a cidade que tanta importância teve para o único Nobel de Literatura do país, unanimidade entre todos os colombianos com quem conversamos, não venda suas obras. Em Bogotá, no Centro Cultural Gabriel García Márquez, encontramos outro que fiquei com vontade de ler depois de visitar a casa: “Vivir para contarla”, a primeira parte de uma auto-biografia publicada em 2002, que já adorei na primeira página. No final das contas, tudo certo. Chegamos felizes a Cartagena para começar nossa saga na América do Sul, e saímos contentes de Aracataca. Agora, tudo que desfrutarmos no restante da Colômbia será lucro. Larry, I think I will keep writing just to have you making these comments. So beautiful! Thank you, thank you, thank you!